Western blot analysis (lane 1) and Immunoprecipitation (lanes 2-3) of extracts from SW480 cells. APC was immunoprecipitated with APC Antibody (lane 2) or with rabbit IgG (lane 3) to confirm specificity. Western blot detection was performed using APC Antibody. 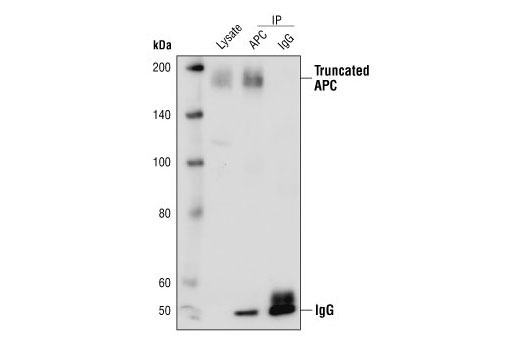 APC Antibody detects endogenous levels of total APC protein. Polyclonal antibodies are produced by immunizing animals with a synthetic peptide corresponding to the sequence of human APC. Antibodies are purified by protein A and peptide affinity chromatography. The Adenomatous Polyposis Coli (APC) tumor suppressor gene is mutated in most familial and sporadic colorectal cancers and encodes a large cytoplasmic protein that is implicated in cell migration, cell adhesion, and proliferation (1). APC binds directly to microtubules and lack of APC leads to defective mitotic spindles and aneuploidy due to missegregation of chromosomes (2). APC is well characterized as a scaffolding protein, binds to β-catenin, and is involved in the regulation of its intracellular concentration. In the absence of a Wnt signal, GSK-3β phosphorylates all three members of the APC-β-catenin-axin complex and this phosphorylation of β-catenin creates a recognition site for ubiquitin, the signal for proteasome-mediated degradation. In the presence of a Wnt signal, dishevelled inactivates GSK-3β and β-catenin coordinates gene transcription of proteins important for the control of cell cycle progression and proliferation, such as cyclin D1 and c-Myc (3). Shih, I. M. et al. (2000) Cancer Res. 60, 1671-1676. Kaplan, K. B. et al. (2001) Nat Cell Biol. 3, 429-432. Fodde, R. (2002) Eur J Cancer. 38, 86-871.